Or should I say, the final outfits and the outfits that were learning opportunities. 1. Super casual! I have to return the shoes, too small. I felt this version worked better than #2. 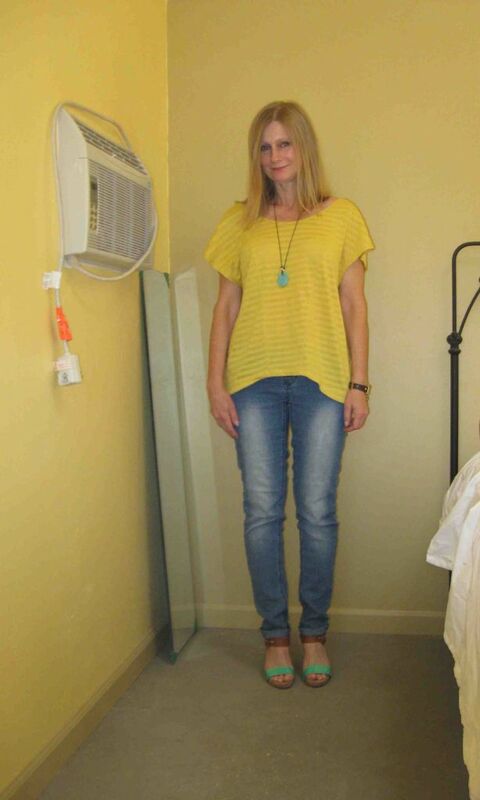 Better choice of bottoms (less contrast w/ top), footwear and necklace. 2. This was the first version (worn a whole day). I had been very sick and this was the first day I managed to get myself dressed. I felt OK in this outfit but after looking at the picture I thought, OMG! 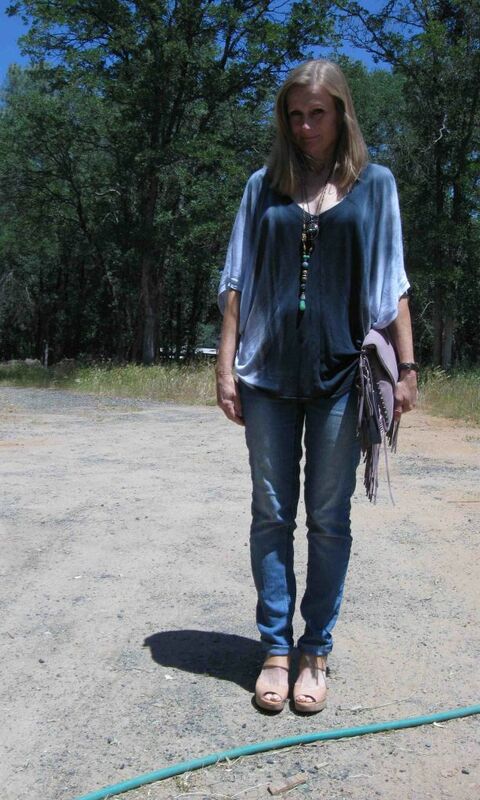 open-toed flatforms next to a horse! He is very gentle though. 4. These last two pictures are taking some courage to post. 70% of the time I look like this. And this is how I look, right now, I'm starting work at 4pm today. 5. However, I do think I've improved my uniform since last year. I do still wear boot cuts but try to keep with darker washes. No more t-shirts any more, which I think befits this "mature" waitress. I took this picture Feb. 2011. YLF has been a good influence! Comments welcome and thanks for looking! Hello YLF -- it's been a while since I posted a WIW. This is a very casual outfit (waving to Cheryl). The Boho nature of the bag inspired me to go in that direction with my layered necklaces. Top -- From last year, brand? purchased off Gilt. Necklaces -- The shorter one is from Lucky, the long one is vintage from the 1920s. I have made a passionate commitment to tonal dressing this season! Even at risk of boring you with more of the same, here are some recent WIWs. 1 -- 7FAM white "The Slim Trouser" jeans I got last year. De-orphaning them along with my already much-worn holey Willow & Clay sweater and highlighter pen colored leather belt from J Crew (also in heavy rotation). 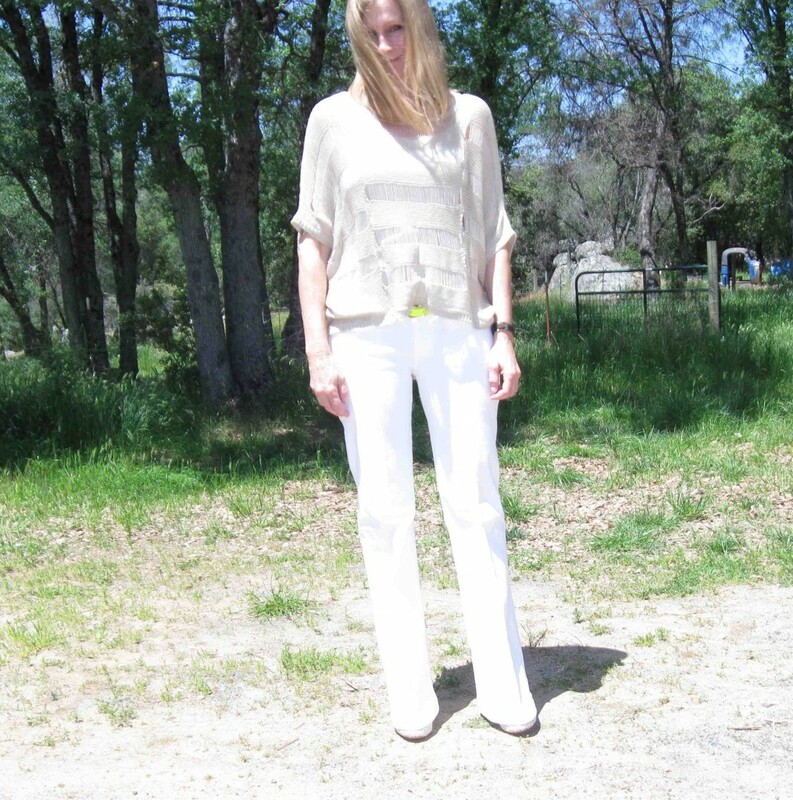 2 -- Else yellow gold jeans from Macy's, Zara blazer from last year, cream shirt from Elements (Macy's). 3 -- Day 1 of Bella's Inspired by Nature challenge. 4 -- Day 2 from challenge. I posted these in the challenge threads already. ETA -- Everything here has been re-mixed except for the ankle length trousers in picture #3.